The quote on that cover is so outrageously fanatical, so utterly devoid of truth (metaphorical and material), the cover art is so crazy… that this cover starts to suggest clinical schizophrenia. See? It starts with “harmless” cats in human clothing, and ends with… crawling chaos. You have been warned! Cats are evil! Evilll!!! Oh sure, try to fool us into believing cats can write with a quill – but you didn’t reckon on the cat writing on the wrong side of the envelope! What a giveaway! 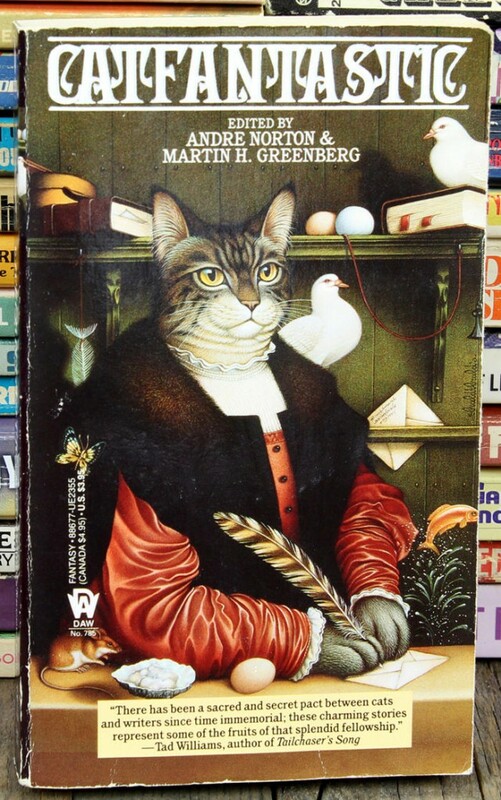 Oddly enough, I am less bothered by the weirdly realistic cat head sticking out of that early English Renaissance outfit than I am by the bizarrely outsized cat’s paws sticking out of the cuffs. In other words, a cat head stuck on an otherwise human body with human hands does not trouble me. But this … The cat head is so very realistic. Where do those paws come from? Why are they so big? How long are those forelegs? What is the shape of the creature under those clothes? Pigeons, fish, mice: you are not safe. It’s a cat, dammit! Run for your lives! What about font problems? My eyes are suffering here. How many chins does he have? Fat cat or what! Cat goin’ down with heat stroke in about 5 minutes in that outfit. How much depth is there in this picture? Doesn’t Kitty rest her head against the shelf? I keep thinking there’s some kind of otherworldly horror hiding beneath those clothes. It’s only through the greatest of coincidences that its head and one set of it’s pseudopods looks remotely like a kitty. Thank you, i couldn’t remember the name of the painting or the artist Catfantastic was ripping off. It was driving me nuts. Pretty awesome art homage, actually – but those paws, yeesh. I think I own another cat-related book by this Andre Norton chap. I’m not surprised. The feline conspurracy runs deep! @Herm: Andre Norton, a major fantasy author, was a woman who took a pseudonym because when she published her first novel in 1934 the feeling was that nobody would buy fantasy written by a woman. I don’t think she wrote anything about kitty cats. Cool, thanks Allesandra. I have an old, battered copy of Catseye from somewhere. Probably a candidate for this site, in fact – the cover is very pink… and cattish. *Alessandra. Sorry, I swear that was what I typed. Pink? Egads, that’s not even a book about cats. Dang! Someone beat me to posting this, Although I was going to enter all 5 volumes in a go. Yes, there are 5 of these lovely abominations out there. All of them have covers in which a classical portrait has the person replaced with a cat, to variously ludicrous effect. My personal favorite was vol. 3, where the cat is obviously going to a masque…with a cat mask. In the books’ defense, they aren’t bad collections of short stories featuring cats. All science fiction or fantasy…And there isn’t a single story featuring cat people!! Which is almost unbelievable, but a nice change. Some of the cats talk, though. There being no cat people, however, makes the covers an even odder choice. Puts me in mind of my neighbors cat Hieronymouser Bosch. And yes that was his name. Til he was flattened by a mail truck.Silly cat couldn’t read but he was always expecting a postcard. The font brought to you by too much catnip. Other than the font and giant paws, I’m okay with this. But then I wuv kitties. Norton wrote a classic short story featuring a cat (All Cats Are Gray), and a whole juvenile novel about cat people (Breed to Come). Also several books where a guy has a giant telepathic cat, probably some others. She liked the felines. Google her and you get a photo of her holding a rather handsome tuxedo beastie. I tawt I taw a puddy tat. On this site, any random page is liable to get you a puddy tat, or at least a puddy tat person. @GSSyvester ex-noob: Yes, and there’s a conveniently placed hyperlink to test that hypothesis. Not as many as I’d hoped, actually. Any clues as to the nature of this “sacred and secret” pact? Does it have anything to do with the sinister feline cabals depicted by Louis Wain in his “normal” period? (see link in A.R.Yngve’s first post). What really sent the man mad? And is there any connection with the Great Mermaid Conspiracy? Meh. More like “Catadequate” if you ask me. @DSWBT: Well I say it’s catpassable. Cattolerable. Catcompetent. At least it didn’t leave me catatonic. Why would you purrdict that? Before he eats he has to say amousing grace..
You’ll get so many you will have to prepare a …ologue. Well I for one am feline better. Concatulations. This site is pawsome! We gato stop making such puns. They should be a feliney offence. @GSS ex-noob, Tor et al: enough of this chat. @GGGxN: Well, if not a feliney, then at least a misdemeow.